While I enjoy the speed in "building" a foam kit, there is a huge sense of accomplishment earned from building, covering, and flying a balsa kit. The closest most will ever get to building a balsa plane is building a balsa ARF. It would be nice to see the guys from FliteTest build a balsa kit from a kit, although that would likely require more time than they'd be able to devote unless it were more of a long-term project presented in a series with a new episode every month or so. Balsa kits are MUCH better now than ever, with most kits including laser-cut pieces which give you a relatively easy build. Granted, kit design and the quality of the cutting will vary from company to company, but there are some which really stand out by providing extremely high quality products. Many kits can be built in a short amount of time. An interesting twist to the idea of FliteTest doing a balsa build would be to invite viewers to join in and build along with the crew. Find a reliable supplier such as Mountain Models, order the kit, covering, and any extra materials needed ahead of time, and then work step-by-step with FliteTest to build a plane. Maybe start with the wings, next episode the fuselage, then the tail, followed by electronics, covering, etc. If FliteTest isn't interested in doing something like this maybe somebody else would be willing to lead the charge. It would again be a good way to introduce people to the wonderful world of Balsa Building. Some say that balsa flies better. I don't know if that is necessarily true, but I do fly my balsa planes more often than my foamies. I love the way FliteTest makes fast to build planes and think that most people on the forum don't want to spend the time and money building a balsa plane. There are lots of very good sites and videos on the tube dealing with all kinds of balsa bashing, covering, balancing and other things needed. They could build an Herr Cloud Ranger. It looks like a quick build and might be a good appetite wetter for some old school building!! Nothing flies quite like balsa!! Oh, and nothing crashes quite like balsa, but that's part of the adventure! In that respect, there are also lots of very good sites dealing with every aspect of foam planes. Their stated mission is to educate and entertain and this is just another aspect of the hobby that people could learn and try for themselves to further their skills. I've got a few foam planes that have been fixed or modified with balsa thanks to what I've learned building balsa kits. One plane waiting in line for work will have the entire tail re-built in balsa instead of simple foamboard. Also, winter is considered by many here in the north to be "building season", as flying in 3 degree weather while standing in a foot of snow isn't for everybody. It's a great way to stay active in the hobby while waiting for warmer weather. That looks like an interesting kit, and if I saw the right price it looks like a very good deal. I was thinking of something like the Mountain Models Switchback, which is a slightly more advanced flier but still a very easy build (I'm guessing that anybody who wants to try building from balsa already has some flight time under his/her belt). I'd compare it to flying a T-28 as a low-wing trainer. Very stable, yet it's got maneuverability and is still a fun plane to fly. The MM kits are incredibly well made compared to other kits I've built - the quality of the wood and the quality of the cutting is way above average. You're right about crashing 'em. But it's also nice that many of those crashes can be repaired to the point where you can't see the evidence after repairs are done. My Switchback is a good example. The nose was heavily damaged in a crash, but you can't tell now by how it looks or flies. Building or flying in the winter is more of a determine thing. 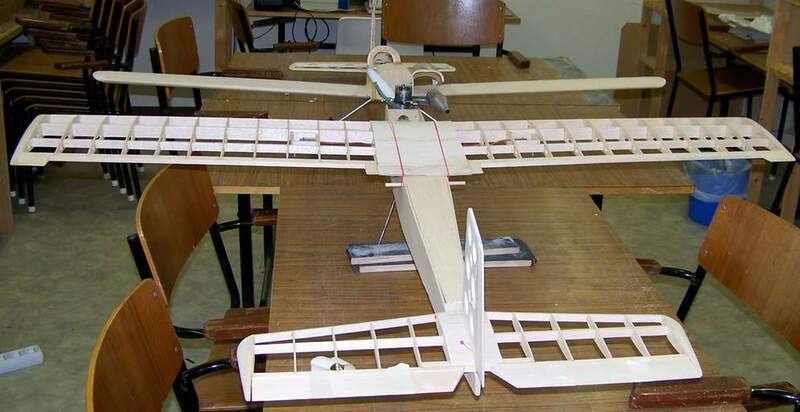 I built two vintage balsa planes the winter 2011-2012. Very nice! My skills are far from that, but my builds resemble planes and fly well so I can't complain. Winter will see a recovering of both Mountain Models planes as the covering is getting a little shabby after 84 flights & 1 crash on the Lucky ACE and 60 flights & 1 crash on the Switchback. I've also got a start on a P-40 profile built from control line plans from the 50's, a Red Swan powered glider in balsa from Hobby King, a Hobby King blatant rip off of the Bird of Time (smaller than the original), and a balsa contest plane for a contest Model Airplane News is running. Plus some various foamies that need their regular attention. But I'm still hopeful that the FT guys would entertain a group build. Example: a specific kit is chosen and build threads help everybody get through it and encourage people to complete the work by doing it in small bites. A goal may be to have a finished plane ready to fly by spring. I think these guys know how much influence they have and how their encouragement really helps keep people moving forward in this hobby. It's like a cult, but without the mass suicide. Heck, I enjoy balsa building enough that I'd be willing to help out new builders as much as possible with build threads, pictures, etc. whatever helps people hit their goal of finishing the plane. And I never volunteer for anything! Balsa dust is my drug of choice. This is about as cold as I can handle for flying (and feeling my thumbs). Back in March I was flying my Switchback for some of it's first flights. My wife video'd as long as possible, but she gave up quickly. Here's a great video I found of the Cloud Ranger. The OS .10 really makes it rip. I just happen to have an OS .10 in the parts bin. It's an older OS that I have, but it never really did get much run time back in the 80's. It should pull around a Cloud Ranger quite nicely. I also have an .049, but I am wanting a little more speed out of it than the .049 will offer. I am sure it would be a pretty docile trainer with the .049, but what's the fun in that A Norvel .07 would be pretty cool on it as well. Looks like a nice flier! I'd certainly go for the electric version as gas/nitro has no appeal to me at all (yet). I just had three of my balsa planes out to play today and the more I fly 'em the more I like 'em. I'm still holding out hope that you and I aren't the only ones out there who enjoy the journey as well as the destination. Come on, FT, stoke the fires and get people in touch with the roots of their hobby! There's nothing like the smell of the nitro, the sound, and the trail of smoke behind the plane as it rips through the air. I will be the first to admit that electric is convenient, clean, and all that stuff, but it just doesn't have the same appeal to me as glow. I do like my electric planes and I fly them all the time, but they will never fully replace an internal combustion engine on an airplane, at least not for me!! Balsa is the roots of this hobby, and so are internal combustion engines. Point taken, maybe I'll have to look into it for next season, although I'd have to find another place to fly as the park I fly at is very quiet and I don't want the police telling me they have to start enforcing the "no motorized flying objects" ordinance (or whatever it's called) the city has for the park. On multiple occasions the police have stopped by, but only to watch and ask questions. No complaints from the neighbors means I get to keep flying close to home! Flying when cold, windy or wet is more of preparation. I am always using a "transmitter bag". It keeps the temperature of the hands and equipment inside the bag and works unbelievable well as soon you got a minute inside the bag with your hands. Electric flight in the winter makes the time outside the bag at a minimum. I got one right when it got warm enough to fly without one this past winter and do t look forward to cold weather to try it out! A glow engine is probably not a good option for a park. I think a lot of people are a little bit scared of the glow, it is definitely more intimidating than an electric motor. If you do fly glow in a park, I would only do it at times where there will be very few people around. I am lucky to have access to a pretty nice AMA flying field so I have a great place for glow flying. At the moment I only have one glow plane and it's under repair... I do have the RCM Senior Telemaster plans on the way as well as an old Sig Kadet MkII sitting in a box unbuilt. Once the flying weather isn't as good, I am going to start some builds. I actually want to get three balsa planes done this winter. Two being the Kadet and the Telemaster, but I also going to build the Cloud Ranger. Of course I will also be obligated to build any of the cool FT swappables aswell. My six year old is dying to see a bi-plane fly, so I need to get my Baby Blender plans out and build the BB. I am thinking my Lazer Toyz "The Beef" pack with fly the BB very well. Hopefully there will even be room for a 2200 mAh battery. With the Spitfire really only having space for a 1300, I am only getting five minutes of flight on the Spitfire. I fly nitros and electrics and you definitely don't want to fly nitro where it will annoy people because they will shut you down if they can. People love to come and watch my electrics and often come and ask questions but we fly nitros out and away from people. We also don't want to many spectators around big nitro Helis for safety reasons. My park is wide open for now as it is still under construction. Only a baseball diamond, archery range, and horse trails right now. But the area we fly is slated to get three ball diamonds soon. Then we move to the undeveloped area that will eventually be soccer and football fields. But for now we have a brand new big parking lot and mowed field to play with, a perfect area to fly. Hmmmm, the guy I fly with only has foamies, but just told me he wants to build a balsa plane this fall/winter. His first try at it. That's ONE builder so far....! He really likes my Mountain Models Switchback and is leaning that way for now. hmmm, now what box did I pack those t-pins in? Cool, including me that is a tentative three builders.